Personal seal maker Hankos has just released its Pokémon Pon inkan (pon is the Japanese onomatopoeia for pressing down a stamp with a forceful flourish). Each stamp is made to order, combining your choice of Pokémon with your family name. Here’s an example pairing Pikachu with Sato (which, ironically, makes it a hanko SoraNews24’s Mr. Sato can’t use). … or a plastic, self-inking stamp. Obviously, Pikachu is the most heavily featured species in Hankos promotional images. You’re not stuck with the franchise mascot by any means, though, nor are your other options limited to Eevee or starter Pokémon. Hankos is offering no fewer than 151 different designs, covering the entire roster of original Kanto Region Pocket Monsters. We promise there’s more information (including ordering information) below, but we couldn’t bring ourselves to break up this beautiful collection of samples. You can choose your favorite from the original 151, which is pretty incredible! Whether it's fan-favorites like Pikachu or Eevee, or more obscure monsters like Electrode or Rapidash, there's no way to go wrong. Plus if you can read Japanese, these photos are a great way to familiarize yourself with the difference between the names of each creature in Japan and English! And again, these aren’t toys or arts and craft supplies. 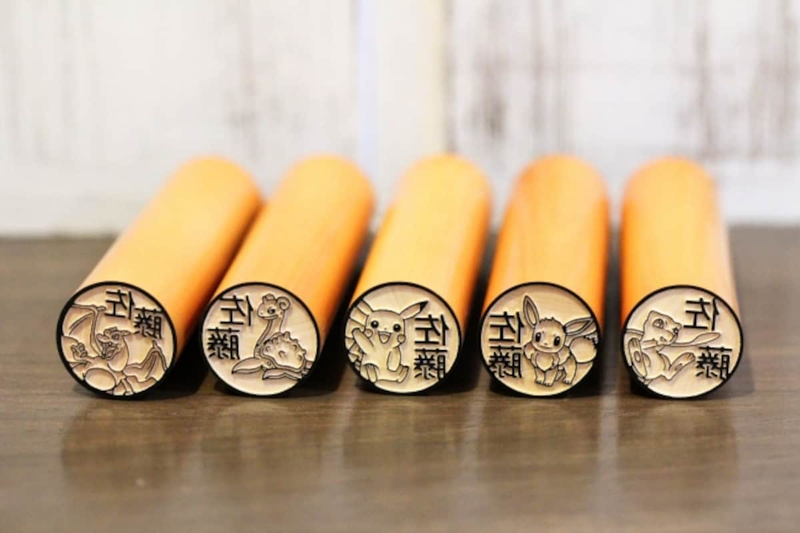 The wooden and horn Pokémon hanko are legally recognized by major banks including Sumitomo Mitsui, Mizuho, Mitsubishi UFJ, Risona and Yucho. Parcel delivery services such as Yamato, Sagawa and the Japan Post Office also recognize all three types of Pokémon seals. Pokémon Pon personal seals can be ordered online through Hankos’ store on either Rakuten or Yahoo! Prices start at ¥2,000 (about US$18) for the self-inking version, while the wooden and horn seals are ¥5,000 each (about US$44). There’s also a ¥7,000 (about US$62) combo pack that gets you your choice of wooden or horn hanko plus the self-stamping one, and while there’s no discount in price, you do get the cute box shown above (all seals come with a cylindrical illustrated case as well).